Buying beer online seems to be going from strength to strength at the moment - what better way to get a selection of ales from micro-breweries all over the UK than sat in front of your computer with a beer in hand! 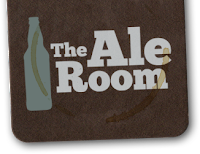 I was contacted recently by a relatively new online beer retailer The Ale Room, who were offering to send me a few samples of their range for review. They aim to offer both traditional mainstream ales as well as more experimental and innovate beers, their website selection certainly backs this up with a range from Morland Old Speckled Hen to Oakham Green Devil IPA! I launched the website in March this year and it has grown month-on-month ever since. I have a background in digital (and print) media as I worked in the advertising department of a large newspaper firm in London for almost a decade. Tired of the rat race, I knew that I wanted to have a crack at being a business owner but also wanted to start a company where I had a genuine interest and passion in what I was selling (ie.not just doing it for the money). I've always liked good beer so I used this passion and the knowledge I'd picked up working on digital projects for the paper to put together The Ale Room. Sadlers Hop Bomb - 5% grapefruit. apricot jam. lemon sorbet. blood orange. gooseberry. peach. mango. passion fruit. pineapple. grapes. lime zest. lychees. melon. papaya.